Take off from the Nebraska Balloon & Wine Festival Balloon Field in the Husker Helicopter. Fly around the Scenic Area for approximately 15 minutes for a Once in a Lifetime Experience and Check it off your Bucket List! Seats are limited and I am sure they will fill up fast, so if you pass the below requirements purchase your tickets Today! 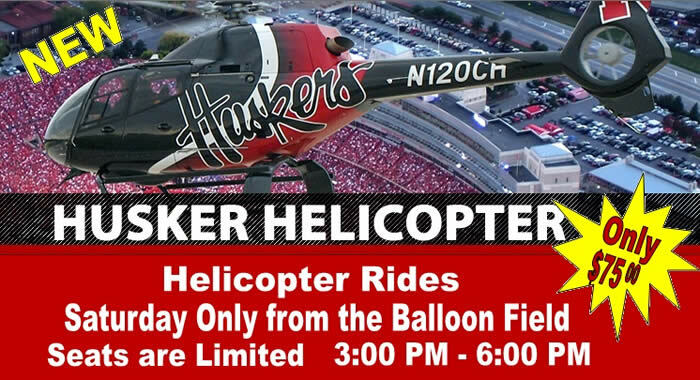 ____ You can be at the Balloon Field Saturday from 3:00PM – 6:00PM. ____ You are willing to sign a release form before you can fly. ____ The Helicopter can fly up to four and your weights will be assessed so if you are interested in flying solo or in a group we can make it happen, it will still be Only $75 per person.